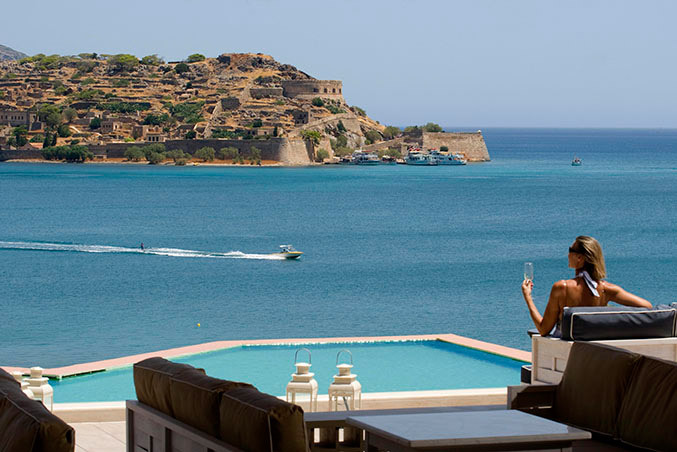 Elounda – a famous luxury destination worlwide in the magnificent island of Crete. The cosmopolitan resort of Elounda on the island of Crete has gathered the most exclusive luxury hotels in the Aegean Sea. A resort popular with world statesmen, members of royal families and celebrities of stage and screen is welcoming you to live unforgettable in a wonderful environment. Elounda is in a protected lagoon created by the peninsula opposite serving as a breakwater. The peninsula is separated from the mainland by a narrow channel dug by the French in the 19th century. Close by is the ancient city of Olous most of which can now be see lying on the seabed. The island of Spinalonga -a leper colony many years ago- is in the Bay of Mirabello and has the remains of the Venetian Fortress built to protect the area.